The Tokachidake（十勝岳）is an active volcano located in the south of Daisetsuzan National Park,Hokkaido. 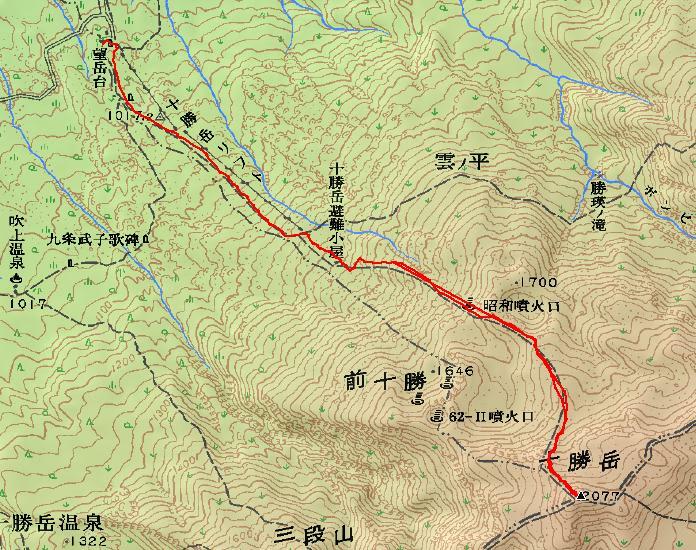 Mt.Tokachidake was named because it is the headwaters of the Tokachi River. It is the tallest volcano of the Tokachi Volcanic Group. The main peaks are as follows. There are several trails to the peak. Trail of Bougakudai（望岳台） is the most popular. and 3hours for the return tirp. When viewed from Bogakudai at the foot of the mountain, it is continuous Mt.Bieifuji,Mt.Bieidake,　Mt.Tokachidake and Mt.Sandanyama. from the left. The hillside of the mountain, there is a hut for emergency shelter（十勝岳避難小屋）. Plume is constantly rising from the crater. On the slopes of volcanic ash,　Hut can be seen small. Summit appears to be still far away. If you go up to the ridge, you can see the whole picture of Mt.Tokachidake. There is a funnel-shaped crater named Suribachi（摺鉢火口）. When walking　the ridge, Mt.Bieidake, Mt.Nokodake has come into view. Mt.Nokodake is shaped like a saw as the name." Water vapor is hung over from the snow filled the swamp. It looks like volcanic ash, but there is snow under it. When you begin to look up close to top, the slope of the mountain trail is tight. To the west of the summit, Mt.Kamihorokamettokuyama, Mt.Sanpozan and Mt.Furanodake is visible,Mt.Furanonishidake is visible at a distance. The south side of the summit ,Mt.shimohorokamettokuyama,Mt.Sakaiyama,Mt.Toyausube,and Mt.Kamihorokamettokuyama is visible. Plume is rising briskly from the 62-2�Ucrater.